Petrified Forest National Park is the only National Park that Route 66, the first interstate highway system in the United States, offering 2,200 miles of open road from Chicago to Los Angeles ending at the beach in Santa Monica California crossed through. 6 miles into the park the line of the roadbed and the telephone poles in front of you mark the path of the famous “Main Street of America.” Of those days gone by, a 1932 Studebaker commemorates this landmark. 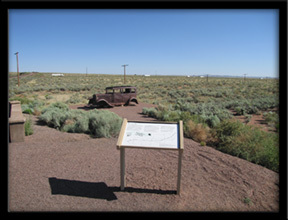 This entry was posted in National Parks, Petrified Forest and tagged 1932 Studebaker, historic highway, Northern Arizona, Painted Desert, Petrified Forest National Park, Route 66. Bookmark the permalink. Why is this Main Street of America?